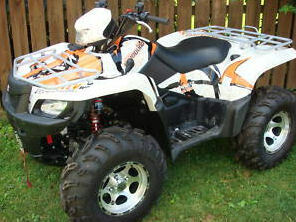 Come on in and find a cheap, used Suzuki ATV for sale by private owner. You can take a look at the classifieds to see if a King Quad or one of the other Suzuki Quads might be listed in an area near you to avoid those pesky shipping charges. Anybody that rides a Suzuki motorcycle might want to play in the mud between rides or use a four wheeler during hunting season probably wants an ATV of the same brand, right? This is especially true if a rider has gotten great performance out of his two wheeler. For this reason, I've often wondered why Harley has never jumped on board and produced a line of ATVs but that's a discussion for another page and another day. On this page, you can advertise your used Suzuki ATV for sale or list any used Suzuki ATV parts for sale that you no longer need free of charge. All I ask is that you snap a few pictures of the Suzuki King Quad that you are trying to sell, write a good description of the four wheeler including how many hours its been ridden (I see that question asked a lot!) and how much you would like to get for it. If you have doubts or questions about your Suzuki Quads value, you might ask your bank's loan officer for the loan value on it, ask around at the local Suzuki dealer or do a search online to see if the ones on Strike Lightning's GoGoCycles Used ATVs for Sale are competetively priced. And PLEASE check the box after you submit your classified ad that indicates that you want to be notified if you get any offers or comments and leave your email address so that buyers interested in the Suzuki ATV for sale can get in touch with you.